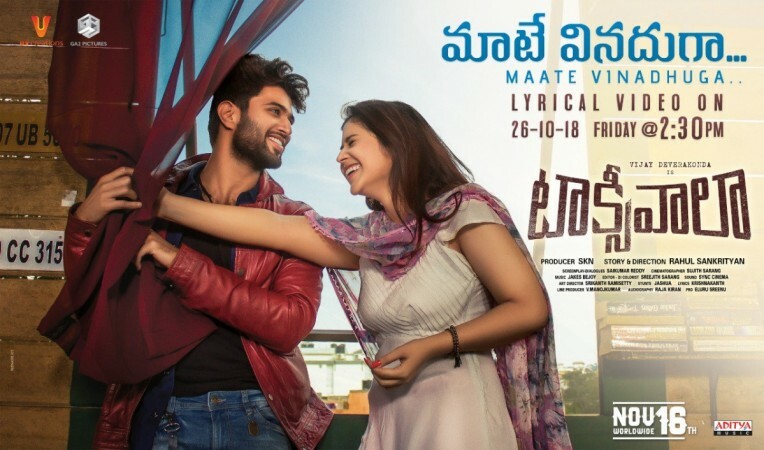 Taxiwala review live updates: Director Rahul Sankrityan's Telugu movie Taxiwaala is a supernatural comedy thriller film starring Vijay Deverakonda, Priyanka Jawalkar and Malavika Nair. Director Rahul Sankrityan's Telugu movie Taxiwala (Taxiwaala) starring Vijay Deverakonda, Priyanka Jawalkar and Malavika Nair, has received positive review and rating from the audience. Taxiwala is a supernatural comedy thriller film, which has debutant director Rahul Sankrityan's script and dialogues. The film has been bankrolled by SKN, Bunny Vas, V Vamshi Krishna Reddy and Pramod Uppalapati under the banners UV Creations and GA2 Pictures. The movie has received a U/A certificate and its runtime is 2.10 hours. Taxiwala movie story: The film is about a young guy Vijay, who is a graduate, but becomes taxi driver to earn his livelihood. He gets into all sorts of troubles because of his car. Incidentally, a ghost becomes his passenger and it has a few problems. How Vijay resolves them forms the crux of the movie. Analysis: Debutant director Rahul Sankrityan has chosen an interesting script and laced it with horror, situational comedy and many supernatural elements. He has narrated the story in a superb manner. The second half is dragging and slow, but it is thrilling and entertaining, say the filmgoers. The story revolves around Vijay who happens to be a taxi driver. Incidentally, a ghost happens to become Vijay's co-passenger. That ghost has few problems and how Vijay resolves them forms the basic essence. Performances: Vijay Deverakonda has delivered a good performance, which is the highlight of Taxiwala. Priyanka Jawalkar and Malavika Nair have done justice to their roles and their chemistry with Vijay is good. Ravi Prakash, Uttej and others have done their job well and they are also assets of the film, say the audience. Technical: Taxiwala has decent production values and Jakes Bejoy's background score, Sujith Sarang's picturisation, Saikumar Reddy's punch dialogues and good VFX works are the attractions on the technical front, add the viewers. Taxiwala movie review live updates: We bring you some viewers' reactions on the film shared on Twitter. Continue to read the audiences' response. #Taxiwaala is different and has a story to tell. A film that takes help of big production houses (Geetha Arts and UV Creation) and a hot star @TheDeverakonda to take content to a bigger set of audiences. A decent content film amidst a flurry of formulaic and beaten films! Neat commercial and interesting thriller movie #Taxiwaala cute love, emotions, comedy, all set to the movie. @TheDeverakonda rocking performance. @ItsJawalkar cute performance looks @SKNonline your hardwork will never fails. @UV_Creations hope it will be big success. @Rahul_Sankrityn superb concept bro .. very good taking and perfect presentation without any deviations.. I wish you come with another good concept for your next one .. looking forward . #taxiwaala .. TFI needs more directors like you ..
First half is good .. songs , comedy and Interval highlights #taxiwala#TaxiWaala except 10 minuts in second half overall movie is good .. i think we should appreciate new director. I would recommend this movie for this weekend. First half is good , second half above average and good climax. #Taxiwaala - What a mad cool film !! @TheDeverakonda delivers once again , this time even bigger. @Rahul_Sankrityn and @EdulaSaikumar - Kudos to you both for that amazing story and screenplay. Loved @ItsJawalkar's performance in the movie.